My great-grandfather Glenn M. Kaiser served during World War I, serving in the 127th Infantry, 32nd “Red Arrow” Division of the Army. He was drafted in September 1917, and was sent overseas in February 1918. His company fought in France and Germany, and he was part of the occupying army after the war was done. He was a Private, and was later transferred to a cook. He was honorably discharged on 19 May 1919. While he was in the Army, he sent frequent letters back home to his mother Jennie (Holbrook) Kaiser and siblings Katie, Floyd, and Anna in DeKalb, IL. 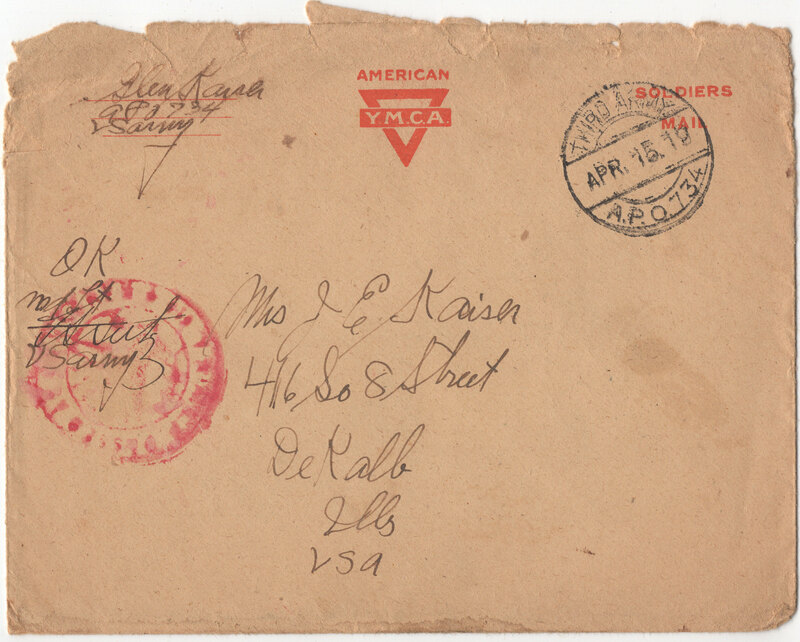 Some of his letters survive, as well as some letters from his brother Alfred Kaiser and a friend named Harry Aument. I have scanned the collection of 45 letters and transcribed them below. Transcriptions may include minor spelling corrections, added punctuation, and clarifications in brackets to improve readability. Click on the link for each letter to read it. Then, click on the image of the letters to see them full-size. Full-size letters are large files and may take longer to load, depending on your connection speed.